Canvas is top lot estimated at £1.5-2.5 million in upcoming Russian Sale. Konstantin Makovsky's painting Ivan Susanin, which was painted in 1913 to mark the 300th anniversary of the Romanov dynasty and is the highlight of the sale, goes under the hammer November 24 at Sotheby's in London. The famous auction house has set a pre-sale estimate for the canvas of £1.5-2.5 million. "The Russian Sales at Sotheby's will include Konstantin Makovsky's masterpiece, which is dedicated to the legendary Russian hero Ivan Susanin, who according to tradition saved the life of the founder of the Romanov dynasty in 1612," Sotheby's told RIA Novosti. "This event can be called the 'second birth' of the monumental painting, which the artist painted for the 300th anniversary of the Romanov dynasty." The last time the painting was exhibited in public was in 1926. It was recently discovered in the home of a private American collector, who had bought it at Sotheby's Parke-Bernet Galleries in New York in 1976 for $4,800. On November 21, three days before the auction, the painting will again be shown to the public. The canvas was one of the last large paintings that Makovsky painted in his Paris studio a century ago. According to tradition, in the winter of 1612, on the eve of Mikhail Romanov's ascension to the throne, a unit of Polish nobility, or Szlachta as they were known, went to the Romanov family settlement not far from Kostroma, some 200 miles from Moscow, in order to seize the pretender to the throne. Losing their way, they turned for help to a local peasant named Ivan Susanin. As a loyal subject of the future Tsar, Susanin led them out of the settlement into an impassable forested swamp. Realising they had been deceived, the invaders turned on and killed Susanin. But thanks to his feat, six months later, in the spring of 1613, Mikhail Romanov was crowned Tsar. Susanin's deed is immortalised in Russian literature, painting and musical compositions, one of the most famous being Mikhail Glinka's opera A Life for the Tsar, which was first staged at the Bolshoi Theatre in 1836. It is believed that it was this opera that inspired Makovsky's painting. 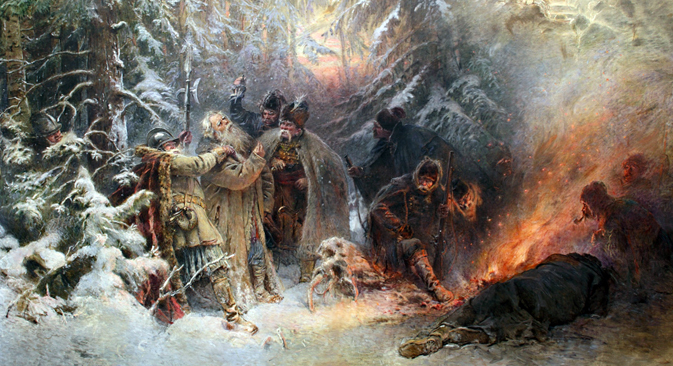 Just like the fourth act of Glinka's opera, Makovsky's painting shows the exhausted Polish soldiers, waiting by a fire for a snowstorm to end. Having woken up, they understand Susanin's true intentions and he admits that he has laid a trap, which infuriates them and ends in the hero's death. In the opera's final scene the choir sing the famous "Hail to the Tsar" and the Muscovites welcome their ruler on Red Square to the sound of church bells. Makovsky included both scenes in his painting: in the foreground we see the dramatic moment of Susanin's death and in the background, Mikhail Romanov's solemn coronation procession on Red Square.